This past weekend, the Democratic Party voted against including a fracking ban in their party platform. The Republican Party wouldn’t even discuss a ban. 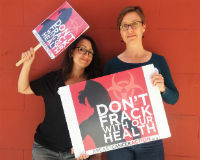 For far too long, our elected leaders have failed to take action to end fracking and other forms of dangerous drilling that use cancer-causing chemicals. We need ALL our elected officials—no matter what party they belong to—to know that we want representatives that are going to put public health before oil and gas industry profit. That’s why, in less than two weeks, as the nation’s spotlight shines on the Democratic National Convention in Philadelphia, we’ll be marching to call for a ban on these toxic processes. 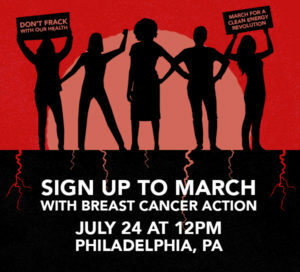 Join us on July 24 as we march to demand a clean energy revolution. It’s up to us to hold those in power accountable for our health. Don’t miss this opportunity to be part of this momentous action. Our executive director Karuna Jaggar (right) and I (left) look forward to seeing you there! P.S. Read my piece in EcoWatch here for a more in-depth understanding of why Breast Cancer Action is marching for a clean energy revolution.